Administrator members form the backbone of any successful Classlist site, from your faithful Class Admins to the Community Rep organising a one-off Easter Egg hunt. Only Ambassadors or Staff Admins can assign other members admin status; both ways are accessed in the green Admin Mode. You can't change or add your own admin status - you'll need to ask another Ambassador or Staff Admin to do this for you. NB: a parent must be an existing approved member of your Classlist site before you can assign them an admin status (except in the case of school Staff Admins). On the 'Approve' page, via the recently approved list. After approving the parent, find them in the 'recently approved' list below. Click on the chevron to the right of their name to go to their profile, then click 'Make Admin' (next to the pink cog-wheel icon). You can then select which admin role you want to assign. From the 'School Profile' page. Find the pink + symbol (below) in the relevant section for the Admin role you wish to fill, then enter the name of the parent. You can add a label if you wish. You can add Ambassadors, Class Admins, Community Reps and School Staff* from this page. From the 'All Parents' page via a parent profile (not for Staff Admins). Search for the parent you want to appoint on the 'All Parents' page, click on their name to go to their profile, then click 'Change Admin status' (next to the pink cog-wheel icon - see below). You can then select which admin role you want to assign. For more information on the permissions for all the roles, please click here. A member can have more than one administrator role assigned, but you need to assign each role separately, you can't do both roles in one action. However a Staff Admin cannot have another role as the other roles are all parent roles. Go to the parent's personal profile and tap 'change admin status'. The dialogue box (shown below) allows you to remove admin status as well as add more. You need to remove an admin status before replacing it with a new one if you just want to swap someone's role over, rather than adding an extra role on top of an existing role: eg changing from someone being only an ambassador to only being a class admin. 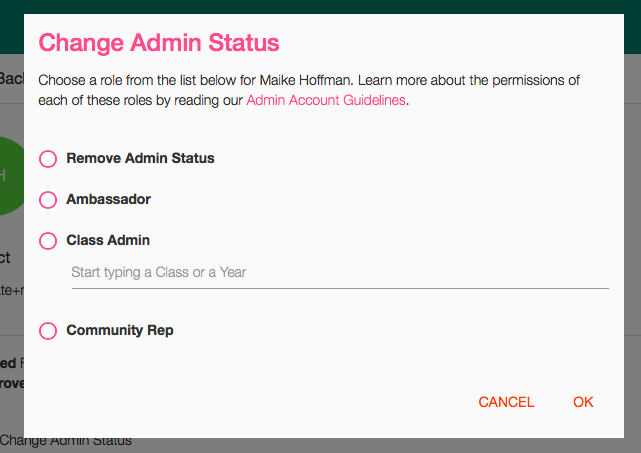 To add a new Ambassador, Class Admin or Rep, simply click the pink + icon next to each role on the School and Admin Profile page. A small dialogue window will appear; enter the name of the the parent you wish to assign the role, and add a label if you wish (eg Events Manager, or PTA Chair). Class Admins have the + icon ready next to each class so make sure you put the right name in for the right class! NB: A parent can be a Class Admin for multiple classes, even if they do not have a child in that class. However, if they don't have a child in the class they will only be able to send Announcements to the class rather than post on the class feed. If they need to send posts, they can either send to the whole year group (which includes all classes), or it will be necessary for them to create a 'pretend child' eg called 'class admin kid', who is registered in the other classes. To change someone's Admin status after they have been appointed, simply click on the parent you want to change where they appear on the School and Admin Profile page, or find them in the All Parents page. This brings up their personal profile and you can click the cogwheel icon to change their Admin Status. We understand that the roles we have given may differ to those used at your school and PTA. This is where the handy 'labels' feature comes in. When you assign a parent an Administrative role, you are given the option of adding a label, you can use this to describe their role eg a Community Rep may be labelled as Eco Officer. *School Staff have the same administrative permissions as an Ambassador, but they do not have access to the parental side of Classlist or the features that relate to that such as Monitor Community. Inviting School Staff is slightly different, as you are not assigning a parent to a role, but rather inviting a new member of school staff to join Classlist. Once you click the + button, you will need to fill out the required details and click Add. The member of staff will receive an email inviting them to join. Please note that Staff Admins will receive approval request emails for all members and therefore the role may not be suitable for your Headteacher! It is aimed more at a staff administrator who is going to help with approvals and send limited communications via Classlist. Tip: If a member of staff needs to be deleted from your site, Ambassadors can do this by bringing up the teacher's profile from the School and Admin Profile page, then tapping on the red trash can symbol. A Staff Admin cannot delete a fellow Staff Admin.